The Epson Stylus photo RX585 is an all in one photo device for printing, scanning and copying providing excellent quality prints. This Epson product is suitable for home and amateur photographers use. The printer boasts a printing resolution of 5,760 x 1,440 dpi and scanning resolution of 1,200 x 2,400 dpi (Horizontal x Vertical). Epson promises high shelf life of photos with Epson Claria Photographic Ink and Epson Stylus Photo RX585 Ink Cartridges. With bulky appearance and sleek black coloured body, RX585 measures 450‎ mm(W) X 413 mm (D) X 205 mm (H) and weighs 8 kgs. 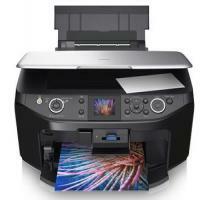 The printer offers an impressive print speed of 37 ppm in monochrome and 38 ppm in colour printing. Stylus photo RX585 can print even without a PC connected with the pictBridge port for printing from a camera and memory card reader for printing directly from memory card using an interactive LCD screen. The printer comes with a USB port and Bluetooth connectivity though lacking networking capabilities. There is an input tray with capacity of 120 papers supporting sizes up to A4. Epson designed this all in one photo printer for providing excellent quality photos with ease at home. Suitable for Home and amateur photographers, this printer is cost effective. Epson promises high shelf life of photos and Epson Stylus Photo RX585 Ink Cartridges ensures extra large colour space and soft graduations resulting in brilliant printouts. Printing without PC connection is a commendable feature which makes it easier for user to print via camera and memory cards directly. The interactive LCD screen along with the high performance of printer makes this user-friendly printer a good deal to avail. Q. Can I know if Epson Stylus Photo RX585 ink cartridges are easy to install? Thanks. A. Yes, installing these ink cartridges is easy and a hassle-free process; anyone with the help of user manual or some experience and guidance can do it. Q. How early can you replace ink cartridges in case there’s an issue with them? A. In case there’s a fault in our cartridges, we can replace them within two days if there are no unavoidable or unexpected external issues like transportation problems and you communicate your requirement at the earliest..
A. We assure you that using compatible ink cartridges would be the best decision you can make. Compatible cartridges yield the same results that originals do at a fraction of cost. We offer the best products and guarantee you’ll be pleased with the ever-helpful and friendly customer support services from our end. We highly recommend these compatible ink cartridges to you. Q. Do compatible ink cartridges also have high quality inks since they cost less than original cartridges? How about Epson Stylus Photo RX585 ink cartridges? A. Please be assured that the quality of ink in compatible ink cartridges is as good as it is in the original cartridges. The ink used in the compatible Epson Stylus Photo RX585 ink cartridges is premium non-blocking quality. Q. Is there a cartridge that also prints light cyan colour in a multipack of compatible Epson Stylus Photo RX585 ink cartridges? A. Yes, light cyan colour, besides cyan, is also available in a multipack of the Epson Photo RX585 ink cartridges. Q. Is the quality of compatible Epson Stylus Photo RX585 ink cartridges genuinely good? Do they bear any quality assurance endorsement? A. These compatible Epson ink cartridges bear ISO-9001 standard guarantee and are in every way on par with the original cartridges. Q. Are Epson Stylus Photo RX585 ink cartridges good at printing high quality images? My work involves sending images of products we manufacture to clients, for which I need good technology and equipment, and I’m not very happy with another ink cartridge I’ve been using. Please help. A. Yes, these ink cartridges print best looking images that will surely help you depict your products before your clients well. Q. I installed compatible Epson Stylus Photo RX585 ink cartridges in my printer a few days back but I started getting an alert about using non-Epson ink cartridges. Does it indicate that these ink cartridges will damage my printer or should I just ignore it? A. Please ignore these warnings and stop worrying. Such alerts are sent by the companies as they want to push sales of the original cartridges they manufacture, which are priced much higher than the compatible ones. Q. I read that light cyan and light magenta colour ink cartridges in the six Epson Stylus Photo RX585 ink cartridges pack come with the latest generation chips. I want to know the advantage of these chips. A. The latest generation chips in these ink cartridges equip them with enhanced compatibility with old as well as new printers, so you will be able to use them with more machines. Q. Are compatible ink cartridges like Epson Stylus Photo RX585 ink cartridges really good for the environment? A. Compatible ink cartridges are basically remanufactured cartridges, which means they are not made from new material entirely. They are made from original ink cartridges and stocked with material like ink after they are ready. Q. Hi, I tried printing the elements of Word Art using my new Epson Stylus Photo RX585 printer. But the output colours are different when compared to the original documents. How can I resolve this problem? A. The standard colour for your printer driver is set as automatic by default because the printer driver uses a Look Up Table based on the object to be printed. Photo realistic mode is used for word art and Vivid mode is used for graphics and text. The problem arises in the documents having two different elements of the Look Up Table. If neither of the mode satisfy your print colour requirement then try investigating on the RGB value and print accordingly. Q. How can I know the level of Epson Stylus Photo RX585 Ink Cartridges left in my Epson Stylus Photo RX585 printer? A. To know the Epson Stylus Photo RX585 Ink Cartridges level you must install EPSON status monitor utility available in the printer software CD. For this insert the CD and select EPSON Status Monitor and then click on the arrow that points to the right and select OK. This will copy the required files. Follow the instructions on the screen and complete the Setup. Now to get access click on Start then Settings and then Printers. Right click on the Epson Stylus Photo RX585 printer and select Properties. Click on the Utility tab and then click on Status Monitor to check your Epson Stylus Photo RX585 Ink Cartridges level. Status Monitor Utility will show which cartridges are low or empty. Q. Hi, I want to print on an Iron on Cool Peel transfer media. How can I do it using my Epson Stylus Photo RX585 printer? A. You can print the desired image on the Iron on Cool peel sheet by changing some settings in the device driver. For this select the media type as Inkjet Paper. Then under the Main tab click on Custom and select Advanced and tick on the Flip Horizontal option. This will make sure that the image that you print will be the mirror image of the original picture so that when it is transferred to the fabric it looks like the original image. Now you can take the print and during this time make sure you have switched on the iron box. When it gets hot, place the printed cool peel sheet on the fabric and iron continuously for a few minute. Then let the paper cool down and finally peel off the backing. Q. I tried scanning using my new Epson Stylus Photo RX585, but I think that the software is not working properly. What should I do? A. If your PC fulfills the system requirements whether it may be Windows or Macintosh, the problem might be caused due to low storage space available for the proper running of the software. Try closing all the unwanted softwares and applications like antivirus and screen savers etc. If you are scanning large images or you are scanning with high resolution, your PC will require more space to carry out the scanning process. Problem can be also caused if your scanner is not selected in the application software and also in case the software is not installed properly. In this case uninstall and then reinstall the software. Q. My Epson Stylus Photo RX585 printer is making noise after installing new Epson Stylus Photo RX585 Ink Cartridges. How can I stop this noise? A. After installing new set of Epson Stylus Photo RX585 Ink Cartridges make sure that the cartridges are placed properly. If yes, then your printer charges the ink delivery system. You need to make sure that your printer is on and wait until the message ‘ Charging…’ disappears from the display. Else while taking a print next time, the printer will extract more ink and cause such noise.